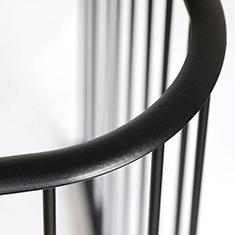 Our range of Traditional and Contemporary Fireguards comprises four standard sizes, but we also offer a made to measure and a fully bespoke fire guard design service. Fireguard fixings available. 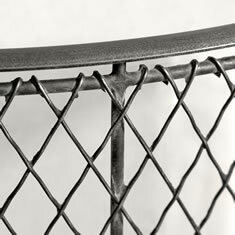 Our diamond pattern, woven mesh fireguards are inspired by the beautiful and practical designs from the past. 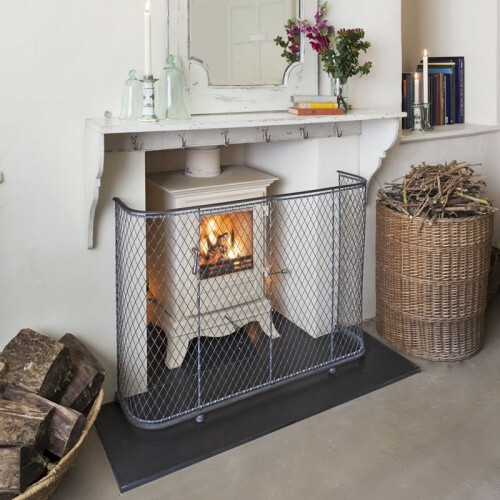 The Victorian nursery fireguard once graced many fireplaces, but is now only made by us. 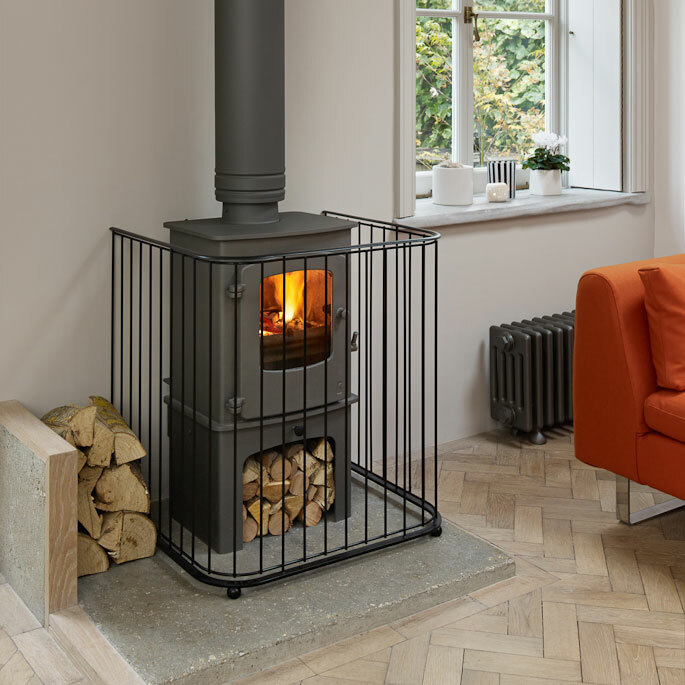 Our new range of Contemporary Fireguards offers the perfect solution for the less traditional interior. 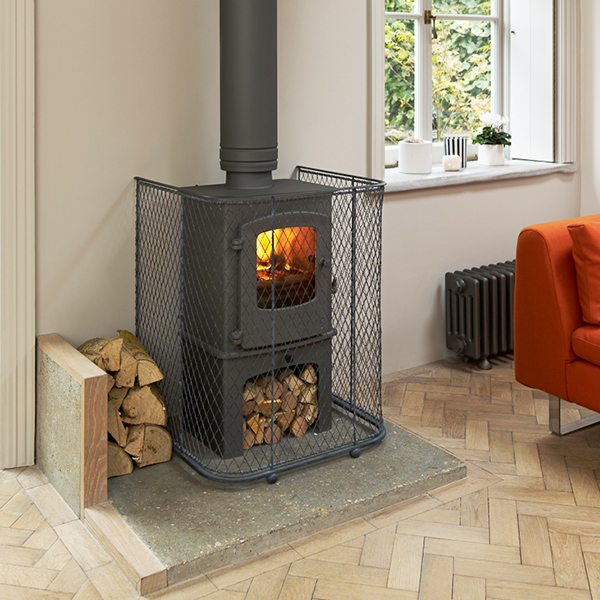 Any sleek fireplace or wood burning stove will be enhanced by this pared down design. 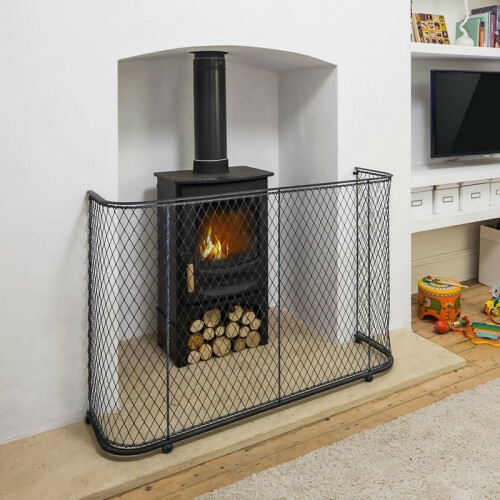 Our robust fireguards are the ideal solution to protect your children or pets from hot stoves. The 2” x 1” sized diamonds act as a rigid, effective barrier. 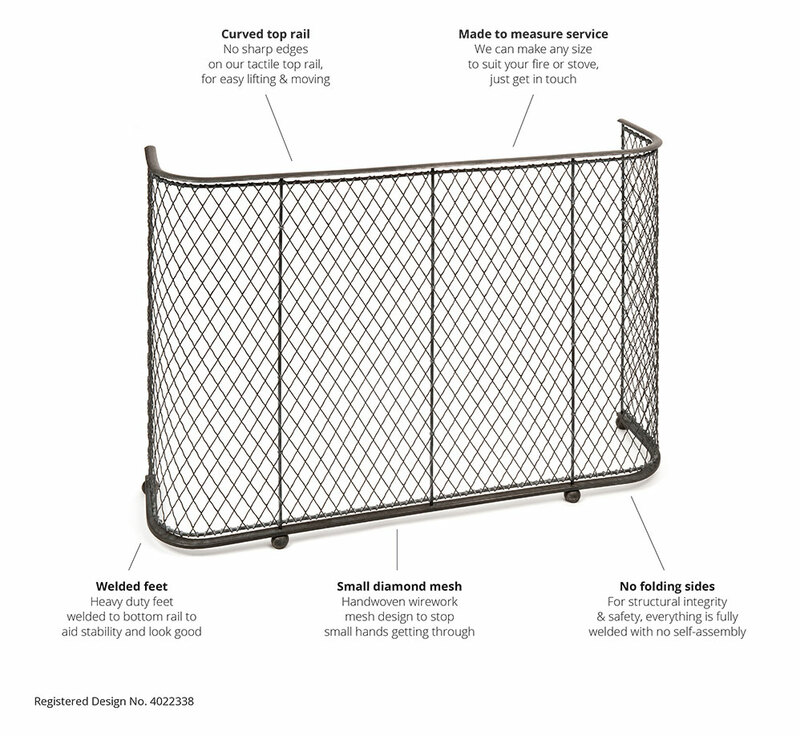 The top rail is made from a solid steel, tactile convex bar to ensure that no sharp edges exist when moving or lifting the fireguard. 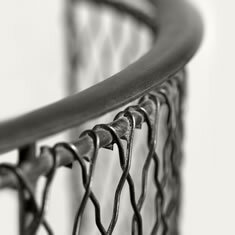 The crimped and handwoven wirework ends are knuckled over the inner framework to create a neat finish to the fireguard mesh. 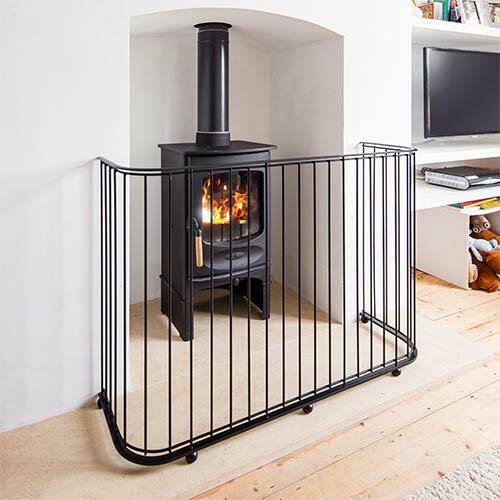 Solid steel feet are discreetly welded to the underside of the bottom rail to provide stability when the fireguard is resting on the hearth. 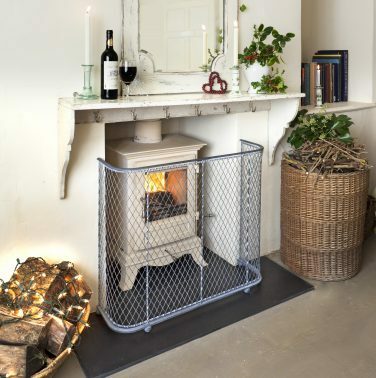 Our Contemporary Fireguard will look good in any interior setting, whatever the current trends. Our pared down, timeless design will never look dated. 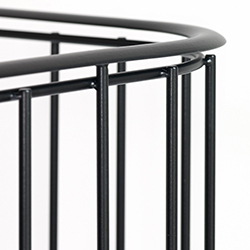 The solid steel, fully welded construction provides the structural integrity required for this sturdy design – no sharp edges, just smooth tactile surfaces. 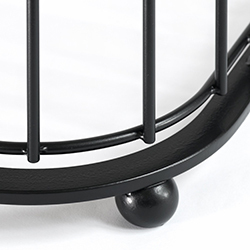 Unlike most fireguards available on the market, our design is far more elegant and has narrow vertical rods only 2”/5cms apart – far too close for the cat’s whiskers. 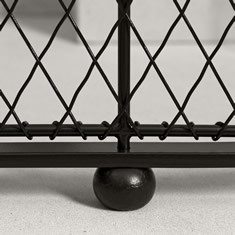 For added stability on the hearth or floor, our solid steel feet are welded discreetly to the underside of the lower frame and add weight to the base. Our Traditional Fireguards and Contemporary Fireguards are available in four standard sizes ranging in widths from 26” to 48” as shown above. 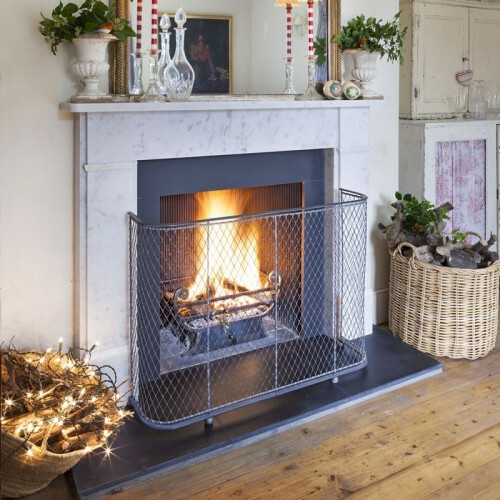 Handmade by us in Bath, Somerset, from zinc galvanized solid steel, the Traditional Fireguard is available in satin Black painted finish or Aged zinc for a mellower patina, and the Contemporary Fireguards are available in a satin Anthracite Grey painted finish. 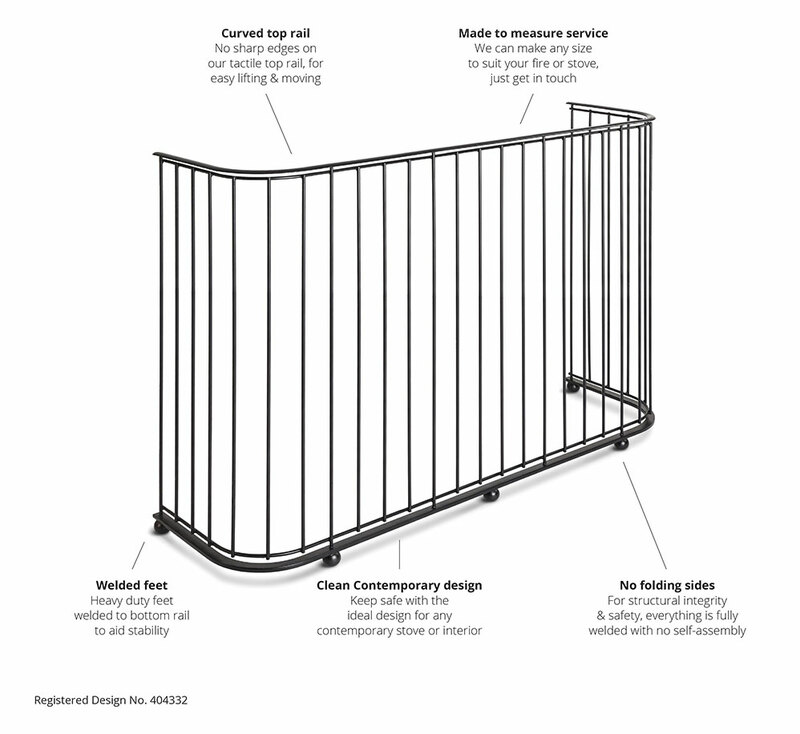 As award winning designers and manufacturers, we can make to measure and can offer a fully bespoke fireguard service. Optional spark liners for open fires and side fixings also available – please get in touch. 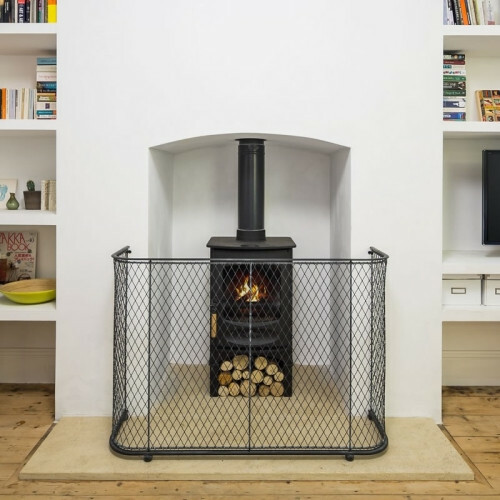 The fireguard is well constructed and looks wonderful, and in the words of a visiting friend ’magnificent’, a real work of art. Thank you for the efficient service. 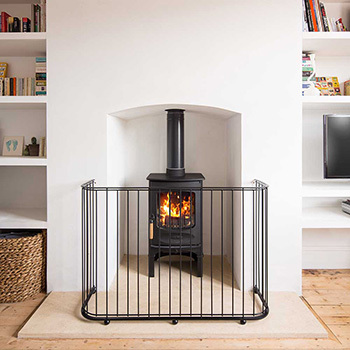 There’s a multitude of stove and fireplace combinations out there, so it’s important to know the best height, width and depth of fireguard for your particular arrangement. Before you call us, please get a tape measure, pen and paper and have a rough idea what size might work for you. 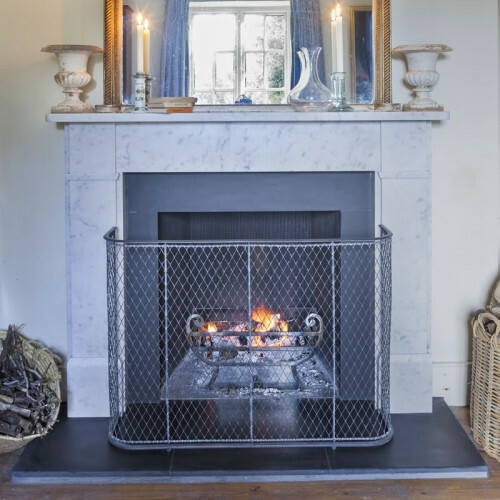 Ideally, email through an image of your fireplace so that we can see what you can see – it makes the process much easier for both of us. Call us on 01225 851577 for detailed advice. We can arrange delivery throughout the United Kingdom. We use an independent courier that offer next day delivery. From £39.50, the price will depend on the number of items and weight of your order; we’re happy to provide a quotation prior to placing your order. Once ready, we will contact you to arrange a convenient date for delivery.